One of life's simple pleasures is to have a jar full of cookies or muffins sitting on the counter. They can either be for a quick snack while heading out or flopping onto the sofa. 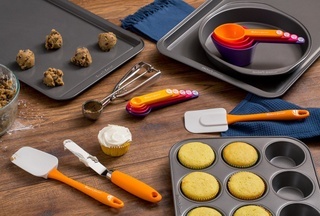 As part of our ongoing series of recipes by a group of talented food bloggers using Baker’s Secret bakeware products, we asked them to create easy-to-make recipes and tasty recipes. Muffins for breakfast or a morning snack, cookies for everyone to enjoy and even a coffee energy bar for an afternoon pick-me-up, there is something for everyone here! Check out the recipes below and enjoy! Cookies, Muffins & Bars to Enjoy! Baked treats to enjoy on-the-go or at home!